Snackeez, the As Seen On TV sensation that is sweeping the nation for creating the perfect snacking solution. Use it at the beach, on the go, snacking in the car or while enjoying your favorite TV show. 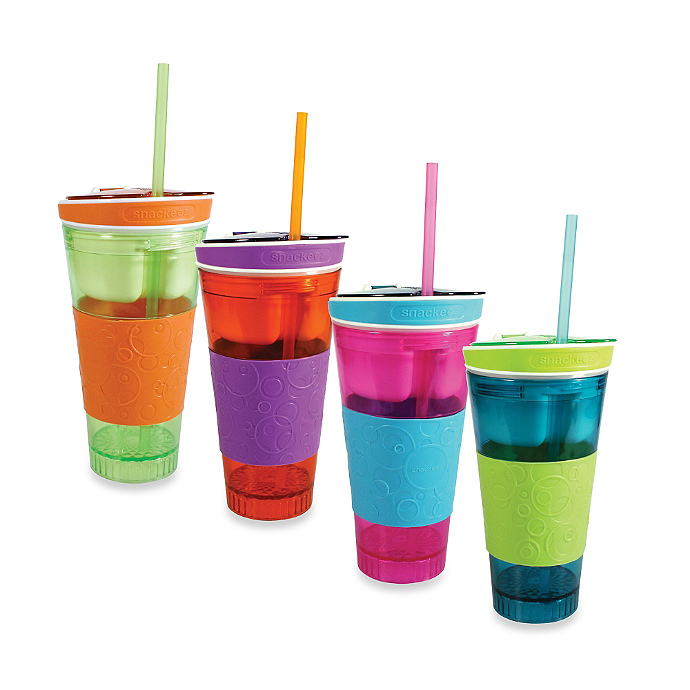 The Snackeez Cup is a 2 in 1 Snack & Drink Cup. Designed for any age, any snack and any drink! Anywhere and anytime, it's Snackeez time!! Snackeez holds a full 16 ounce beverage and 4 ounces of your favorite snack. Comes complete with lid and straw. The cup also features a non-slip grip around the middle of the cup. Insert the Snackeez bowl into the cup, for a solid seal! One easy twist and you are on your way to enjoying a convenient and non-messy way of snacking! Dishwasher safe! As I was taking photos of the cup for my blog post, my son could not keep his hands off the cup. He loves it! He calls it HIS cup! That just shows you right there that kids love these cool, new snacking and drinking cups! The flip-top lid keeps dirt, bugs and germs away.Thank you Snackeez for sending me this awesome cup!